For the first three years of our existence, we were part of the rising tide of multiculturalism, of nonbinary inclusion, of acceptance, and of pride in breaking down barriers between readers and authors who might not look/sound/think alike. Nothing has changed, and yet everything has changed. We are now part of the #Resistance. We remain committed to these goals. Bringing authors together who can shine a spotlight on minority voices in genre fiction, who can entice our fans and our readers to reach beyond the shelves full of names they’re accustomed to seeing. We want to, in a very literal sense, help change the narrative. And our author lineup for this show is exemplary of exactly that. Martin Pousson was born and raised in Acadiana, the Cajun French bayou land of Louisiana. His new novel, Black Sheep Boy, includes stories that won a National Endowment for the Arts Creative Writing Fellowship. Two of his stories were finalists for the Glimmer Train Fiction Awards. 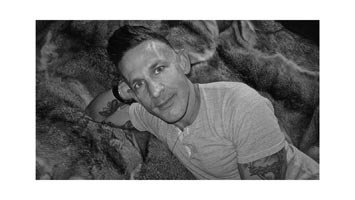 His collection of poetry, Sugar, was a finalist for the Lambda Literary Award, and his first novel, No Place, Louisiana, was a finalist for the John Gardner Fiction Book Award. His writing has appeared in The Advocate, Antioch Review, Epoch, Five Points, New Orleans Review, StoryQuarterly, TriQuarterly, and elsewhere. He earned a Bachelor of Arts in English at Loyola University, New Orleans, and a Master of Fine Arts in Creative Writing at Columbia University, New York. As a student, he founded Out/Here, marched with NO/AIDS Task Force, and protested with ACT UP and Queer Nation. Then he taught at Columbia University, Rutgers University, and Loyola University. As a professor, he advised LGBTQA, Queer Ambassadors, Queer People of Color Collective, and the Pride Center Coalition. He now teaches at California State University Northridge and lives in downtown Los Angeles. Cody Goodfellow has written five novels, and co-wrote three more with New York Times bestselling author John Skipp. His first two collections, Silent Weapons For Quiet Wars and All-Monster Action, each received the Wonderland Book Award. He wrote, co-produced and scored the short Lovecraftian hygiene film Stay At Home Dad, which can be viewed on YouTube. He is also a director of the H.P. Lovecraft Film Festival-San Pedro, and cofounder of Perilous Press, an occasional micropublisher of modern cosmic horror. He lives in Burbank, California, and is currently working on building a perfect bowling team. Lisa Morton is a screenwriter, author of non-fiction books, Bram Stoker Award-winning prose writer, and Halloween expert whose work was described by the American Library Association’s Readers’ Advisory Guide to Horror as “consistently dark, unsettling, and frightening.” She has published four novels, over a hundred short stories, and three books on the history of Halloween. Her most recent releases include Ghosts: A Haunted History and Cemetery Dance Select: Lisa Morton. She lives in the San Fernando Valley, and can be found online at www.lisamorton.com. $10 online or at the door (if there are any tickets left). Books will be sold at the event, courtesy of Skylight Books.